The Historic Plains Hotel places you next to Cowgirls of the West Museum and Wyoming Transportation Museum. This 130-room, 3-star hotel has conveniences like free in-room WiFi, a free airport shuttle, and a fitness center. 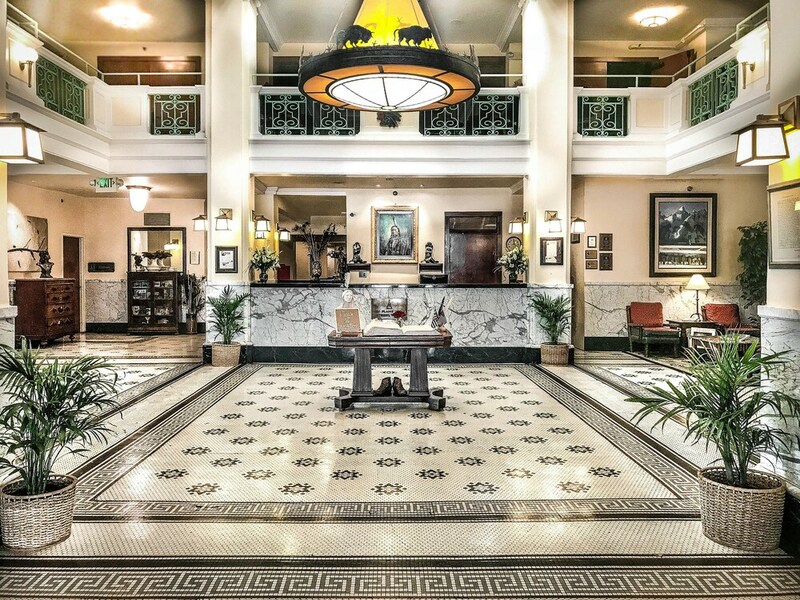 Centrally located in Cheyenne, the hotel is connected to the convention center, and a short walk from Nelson Museum of the West and Wyoming Historic Governors' Mansion. Start your day off right with a free hot/cold buffet breakfast, served on weekdays from 6 AM to 10 AM. Enjoy a leisurely bite to eat at the onsite restaurant, or have a drink at the bar/lounge. Satisfy your hunger from the comfort of your room with room service. A TV comes with cable channels, and guests can stay connected with free WiFi. The bathroom offers hair dryers and free toiletries. Other standard amenities include a refrigerator, a coffee maker, and free local calls. At The Historic Plains Hotel, guests have access to a fitness center, free WiFi in public areas, and a conference center. You can take advantage of free offsite parking, along with a free airport shuttle (available on request). Front-desk staff can answer questions 24/7, and assist with concierge services, luggage storage, and dry cleaning/laundry. Additional amenities include a 24-hour business center, a computer station, and express check-in. The hotel offers a restaurant. A bar/lounge is on site where guests can unwind with a drink. Guests can enjoy a complimentary breakfast on weekdays. A computer station is located on site and wireless Internet access is complimentary. A 24-hour business center is on site at this 3-star property. Event facilities measuring 6900 square feet (641 square meters) include a conference center. This business-friendly hotel also offers a fitness center, gift shops/newsstands, and concierge services. An area shuttle within 10.00 mi and a roundtrip airport shuttle (available on request) are complimentary for guests. The Historic Plains Hotel is a smoke-free property. The Historic Plains Hotel offers 130 air-conditioned accommodations with coffee/tea makers and hair dryers. Each accommodation is individually furnished and decorated. Cable television is provided. Bathrooms include shower/tub combinations and complimentary toiletries. This Cheyenne hotel provides complimentary wireless Internet access. Business-friendly amenities include desks and phones; free local calls are provided (restrictions may apply). Additionally, rooms include irons/ironing boards and blackout drapes/curtains. A nightly turndown service is provided and housekeeping is offered daily. Amenities available on request include microwaves. A complimentary hot/cold buffet breakfast is served between 6 AM and 10 AM on weekdays. Wigwam Lounge - Onsite bar. Open select days. The Plains Conestoga - Onsite buffet restaurant. Open select days. On weekdays, start your morning with a free hot/cold buffet breakfast, available from 6 AM to 10 AM. You can order a meal from room service during limited hours. Airport shuttle service is available on request from 7 AM to 10 PM. Fees may apply. Contact the property in advance to make arrangements. Cribs (infant beds) are available for USD 10.0 per night. This property offers transfers from the airport. Guests must contact the property with arrival details before travel, using the contact information on the booking confirmation. The property has connecting/adjoining rooms, which are subject to availability and can be requested by contacting the property using the number on the booking confirmation.